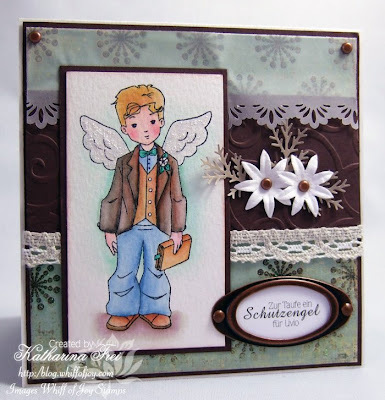 There is a new challenge up at the Cute Card Thursday blog with the theme "Floral fantasy". 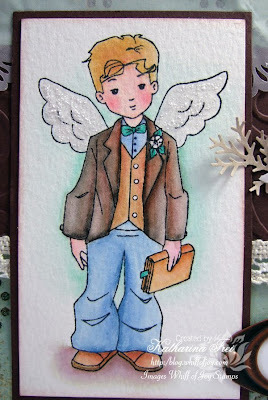 I did a Guardian Angel card for the baptism of my friend's son Livio. Heute gibt es wieder eine neue challenge auf dem Cute Card Thursday blog mit dem Thema "Blumenfantasien". Ich habe eine Schutzengelkarte für die Taufe von Livio, dem Sohn meiner Freundin, gemacht. Guardian Angel Matthew has the duty to watch over Livio and accompany him for the rest of his live :) I coloured him with water soluble pens and Twinkling H2Os, I also put stickles on his wings. I did the glow behind him with the Twinkling colour "Blue Grass" which fits the My Mind's eye backgroundpaper perfectly. 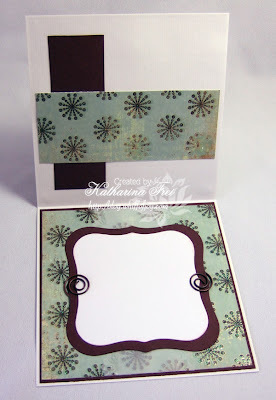 I used a fiskars border punch (Sunburst) on white vellum from Stampin' Up. I am not so excited about the quality of their vellum. It is rather thin, you can't emboss it and it gets crinkles if you use "wet" adhesive. I embossed a piece of chocolate chip cardstock with the cuttlebug folder "swirls". Schutzengel Matthew bekam von mir die Aufgabe ein Leben lang über Livio zu wachen. Ich habe ihn mit Aquarellstiften von Caran D'Ache und Twinkling H2Os coloriert. Den Hintergrund habe ich mit der Twinkling Farbe "Blue Grass" gemalt, da er perfekt mit dem Motivpapier von My Mind's Eye harmoniert. Auf seine Flügel habe ich Stickles aufgetragen. Das weiße Transparent papier von Stampin' Up habe ich mit einem fiskars border punch (Sunburst) bearbeitet. Ich bin von SU's Transparentpapier leider überhaupt nicht begeistert. Es ist sehr dünn, man kann es nicht embossen und es wellt sich wenn es mit Nasskleber in Berührung kommt. 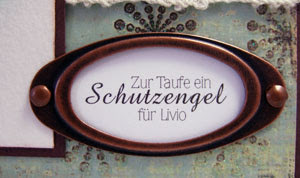 Das Stück braunen Cardstock (chocolate chip von SU) habe ich mit dem Cuttlebug folder "Swirls" embossed. I generated the text on the computer. It means "A Guardian Angel for Livio on his baptism day". The frame is from the SU hodgepodge hardware "Aged Copper". Den Text habe ich am Computer designed und mit einem Rahmen des SU hodgepodge sets "Aged Copper" versehen. I used Spellbinder's Label 1 Nestabilities for the inside, some more SU hardware, vellum and some scraps. Please don't forget my blog candy which ends tomorrow. After my Mr. Linky Widget is free again tomorrow, I will post the promised Whiff of Joy Sommer Stamp Kit candy :) So stay tuned! Ich habe Spellbinder's Label 1 Nestabilities für das Innere meiner Karte verwendet, noch mehr von der SU hardware, Transparentpapier und ein paar Scraps. Danke für eueren heutigen Besuch! Paper: My Mind's Eye, vellum SU, SU cardstock "Chocolate Chip"
a beautiful card for Livio, and what a wonderful sentiment. Thanks for the heads up on the vellum.. will steer clear.. bit of a disappointment for you though..
what a beautiful card Katherina,l love the stamp and colours. As usual, I'm speechless. Wow. deine karte ist mal wieder die wucht! Such a stunning card Katharina, the colours are fabulous and the flowers just pop out! WOW,your card is absolutely stunning and your image is so sweet!!! Stampin'Up! has Vellum and Vellum cardstock,I am not sure which one you used but the cardstock is better.I hope this helps. This is a gorgeous card! Every child needs a Guardian Angel!! have you tried the SU Vellum Card Stock? They carry both the paper and card stock. The paper is really thin, but the CS is nice. Beautiful card Katharina. I love yor coloring and the details you have added. I love the colours you chose & the embelishments are beautiful. Absolutely fab, it fits the occasion so well, i could have done with this stamp for my nephews Holy Communion 2 years ago LOL. Love the preview image for the Summer Kit...SO CUTE!!! Aber ich denke.... du weißt das ich dich nicht vergessen hab. Such a beautiful card, the stamp is lovely and coloured so well. That is beautiful, he will treasure it I hope.